Shawn is a big fan of football. I have never really been into it, but over the last six years I've watched so many games and heard so many player's names mentioned that I can somewhat carry a conversation about the sport. This was the first year I played on a fantasy football league too; Shawn was one player short and he had been asking me to join for years, so I finally agreed. I ended up in 8th place out of 10 - not too bad! I still don't really understand the game though! 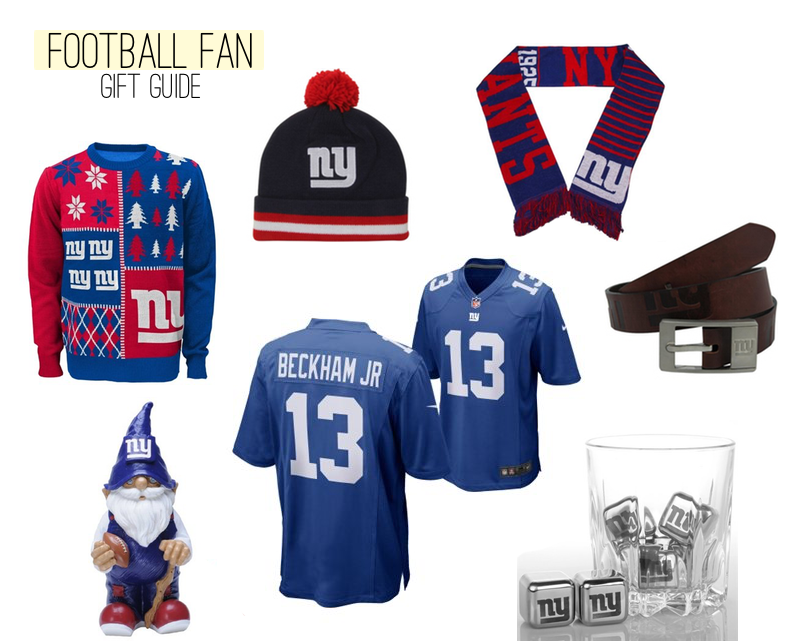 I know that the audience on this blog probably isn't much into football, but since Shawn is, I can only imagine some of you also have football fans in your life and I decided to go ahead and make up a gift guide! I know it's a little late for Christmas at this point... but playoffs are coming up! I picked a few things from Fanatics.com centered around their Odell Beckham Jr jersey, because Shawn roots for the Giants and he has been a big fan of Odell this year. Ugly sweaters are all the rage right now (did I seriously just use that phrase? I did.) That one in particular is for youths, but I'd buy it in a heartbeat if they made it in adult sizes! Shawn is rarely without a beanie, and he's a big fan of the Giant's Throwback gear, so this beanie was an obvious choice. My favorite on this whole list is the belt because it's the most subtle and practical way to show you're a fan! Whiskey is Shawn's spirit of choice, and I can't believe he doesn't have steel cubes yet! We collect garden gnomes, and how perfect is it that they make NFL garden gnomes?! Go check out the NFL jerseys and team gear Fanatics has to offer for the football fan in your life!